Why not treat someone special to a £5.00 gift voucher redeemable at the Underwaterworld store based at Stoney Cove in Stoney Stanton. Includes exclusive Stoney Cove presentation card. Why not treat someone special to a £10.00 gift voucher redeemable at the Underwaterworld store based at Stoney Cove in Stoney Stanton. 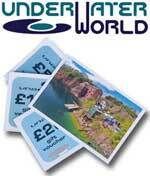 Why not treat someone special to a £20.00 gift voucher redeemable at the Underwaterworld store based at Stoney Cove in Stoney Stanton.